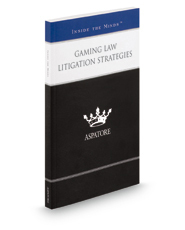 Gaming Law Litigation Strategies provides an authoritative, insider's perspective on the latest trends and approaches to gambling law and how it can vary by jurisdiction. Written by partners from some of the nation's leading law firms, this book guides the reader through crucial topics, such as liability prevention, intellectual property protection, and tactics for negotiation and settlement when a potential case arises. Covering a range of topics from the increased prevalence of Internet gaming to questions of revenue sharing between states and Native American reservations, these experienced lawyers analyze the recent developments involving the gambling industry. Additionally, these experts present examples of how various states handle gaming laws and enforcement. The different niches represented and the breadth of perspectives presented enable readers to get inside some of the great legal minds of today, as these top attorneys provide key insights on this rapidly changing area of law.